This may sound odd but here goes. Last week the daytime temperatures were in the 90’s F (32 C) over the past week end a COLD front dropped in from the north leaving us with beautiful blue skies, cooler weather and the overnight temperatures plunged into the lower 60’s F (15 C) (lol). 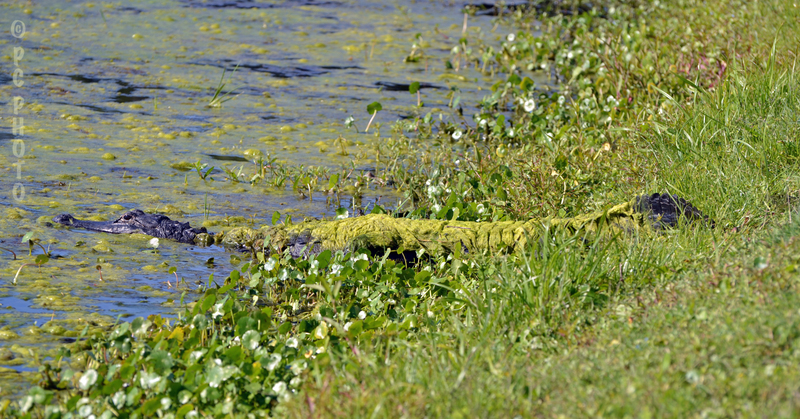 This morning while walking along the lake this alligator was sunning itself on the shore covered with a blanket of algae! Guess it was COLD too, since gator’s are COLD-blooded.